What’s it really like living with Body Dysmorphic Disorder? Recently, the Rotherham-based, Cape-Town-born artist and musician Leigh de Vries has been living by the motto, “Play the card you’ve been dealt”. For Leigh, that cruel card is Body Dysmorphic Disorder: a crippling mental condition that warps the way you perceive yourself. According to the UK’s National Health Service, this undertreated and little understood disorder in fact affects one in a hundred people – a statistic that’s marginally higher than anorexia and remarkably higher than schizophrenia. But many of those sufferers won’t even know they have it. More to the point, perhaps, BDD sufferers often won’t seek help for fear that their disabling preoccupation with perceived defects in their appearance will be misconstrued as vanity or self-obsession. The press may have caught onto revelations that Miley Cyrus and Robert Pattinson suffer from the condition, but given the fact that we virtually all harbour insecurities about our physical appearance, it’s easy to understand why BDD hasn't been granted the serious attention it deserves. Leigh’s latest project, “Exposure: The Broken Reality Tunnel” (2015) is seeking to change all that. With support from Arts Council England, the film-installation was first exhibited earlier this month at The Old Market Gallery in Rotherham, South Yorkshire, where we went to view it. A boxed-like construction, “Exposure”’ invites viewers into dark passages that lead to a projection of a black-and-white film, unveiling the alarming way in which Leigh sees herself: a large tumour weighs down an entire side of her face. While Leigh’s experience of BDD differs to others’, the soundscape to her film reveals the relentless anxiety that is shared by its sufferers. Typically beginning at adolescence – when we’re arguably more prone to the malign effects of media-circulated ideals – BDD affects men as much as women. Yet experts believe it is triggered by biological, psychological and sociocultural influences. We spoke to Leigh about how she has translated her experience into “Exposure”, and what public reactions to the project she’s faced. What motivated you to create “Exposure: The Broken Reality Tunnel”? Leigh de Vries: I’m an artist and a musician, and I make music and videos. Up until I did this project, I would always portray myself in the way I wanted the world to see me – a way of running from how I actually felt about myself. But weeks before shoots I would suffer greatly because of my BDD. I would be tormented by it; I would feel miserable, weak and exhausted. I was really at my wits end when I decided to create the film. I felt the only way forward for me was to face my fear and physically create the monster I perceived myself to be, and then go out in public with it. In my mind I saw this as a reprise – if this is what I was thinking all the time then now I had to make it real, just to get it out of my head. When did you realise you had BDD? Leigh de Vries: I was born with a lazy eye and have suffered from a very distorted self-image my whole life. Eye contact is one of the most important ways humans interact. Can you imagine going on a date or a job interview and not being able to look the other person in the eye? As I grew older, I became more and more isolated because of it. My feelings of being different materialised in an obsession with my appearance, so the BDD really started in adolescence and slowly took its hold. Although I had my eye corrected in 2004, thoughts of my “monstrous self” continued to plague me on a daily basis. How did you channel your experience of BDD into the project, and bring its various elements together? Leigh de Vries: I worked with the makeup artist Shaune Harrison, who created a prosthetic of how I imagined my face to look like. It took about three months to make with numerous castings. Eventually, armed with secret pivot cameras, my two cameramen and I rode the tram and walked the streets of Manchester, filming peoples’ reactions to me. It was a way to capture my own journey of isolation but also make a social commentary on how people react to people with deformities. Originally I was just going to make the film. But that wouldn’t create the sort of controlled environment that I was looking for. If you’re faced with things like dark tunnels and sensory deprivation, you have a heightened experience… you feel slightly out of control, and these are all feelings that you have when you actually have BDD. So the installation was really about navigating the mind of a sufferer. 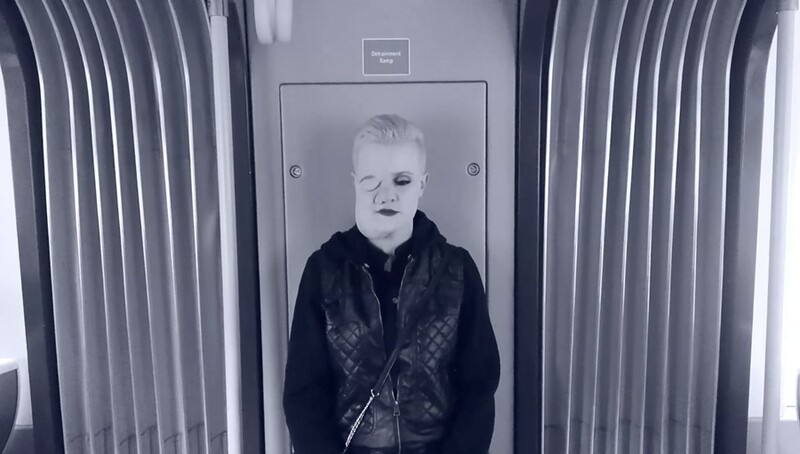 What was it like going on public transport wearing the facial prosthetic? Leigh de Vries: With BDD, because your perception of yourself is that you’re so grotesque, you don’t want to scare people, like I would always imagine that if I went out on the street, children would scream at me. So it was more that I was out in public as the person I thought I was, and it was possibly the scariest day of my life. But the experience turned out to be incredibly cathartic, because when I took the prosthetic off it was the first time I ever realised that I was beautiful. Leigh de Vries: By physically manifesting it, because I think when we keep things in our mind, that’s when they accelerate or get out of hand. But by voicing my experience, I’ve given others the opportunity to do the same. The soundscape to your piece includes other BDD sufferers talking through their experience of their condition. Could you tell us about this? Leigh de Vries: I just contacted a load of artists and people that I know with BDD and said send me a file, so it wasn’t scripted or anything. Sergio, one of the members of the BDD Foundation is one of the voices - he relates his experience of the disorder to the story of his brother who committed suicide because of BDD. What reactions has your project provoked? Leigh de Vries: We’ve had the (Old Market Gallery) open for various youth groups in Rotherham to come down for the outreach programme. After viewing the piece, people have written their responses on the outside wall of the installation, and in the creative workshops we’ve been making masks. One boy wrote on one side of his mask, “my scars are on the inside”. I never imagined that through my honesty and vulnerability I would be able to create something so triggering for others. But what’s most important is that the project has started a dialogue for these young people, especially about what we’re fed by the media and social media about how we should look. Your Twitter and Instagram are full of #Leighsms such as “in a society that profits from your self doubt, liking yourself is a rebellious act.” Could you select one #Leighism and elaborate a little on it? Leigh de Vries: The one that’s been really resounding for me is ‘Play the card you’ve been dealt’. We’re all trying to be something different to what we actually are, and if you imagine human kind as a piano, we’re each a key - we’re each totally unique. Stop trying to be like another key, and play your own key.